Global carbon dioxide (CO2) emissions are set to rise again in 2012, reaching a record high of 35.6 billion tonnes – according to new figures from the Global Carbon Project, co-led by researchers from the Tyndall Centre for Climate Change Research at the University of East Anglia (UEA). The 2.6 per cent rise projected for 2012 means global emissions from burning fossil fuel are 58 per cent above 1990 levels, the baseline year for the Kyoto Protocol. This latest analysis by the Global Carbon Project is published today in the journal Nature Climate Change with full data released simultaneously by the journal Earth System Science Data Discussions. It shows the biggest contributors to global emissions in 2011 were China (28 per cent), the United States (16 per cent), the European Union (11 per cent), and India (7 per cent). 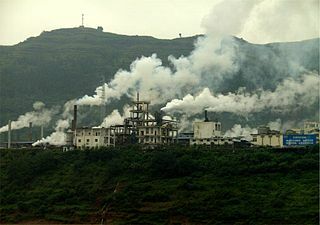 Emissions in China and India grew by 9.9 and 7.5 per cent in 2011, while those of the United States and the European Union decreased by 1.8 and 2.8 per cent. Emissions per person in China of 6.6 tonnes of CO2 were nearly as high as those of the European Union (7.3), but still below the 17.2 tonnes of carbon used in the United States. Emissions in India were lower at 1.8 tonnes of carbon per person. The 2012 rise further opens the gap between real-world emissions and those required to keep global warming below the international target of two degrees. “I am worried that the risks of dangerous climate change are too high on our current emissions trajectory. We need a radical plan,” added Prof Corinne Le Quéré. The analysis published in Nature Climate Change shows significant emission reductions are needed by 2020 to keep two degrees as a feasible goal. It shows previous energy transitions in Belgium, Denmark, France, Sweden, and the UK have led to emission reductions as high as 5 per cent each year over decade-long periods, even without climate policy. Co-author Dr Charlie Wilson, of the Tyndall Centre at UEA, added: “Public policies and institutions have a central role to play in supporting the widespread deployment of low carbon and efficient energy-using technologies, and in supporting innovation efforts”. Emissions from deforestation and other land-use change added 10 per cent to the emissions from burning fossil fuels. The CO2 concentration in the atmosphere reached 391 parts per million (ppm) at the end of 2011. These results lends further urgency to recent reports that current emissions pathways are already dangerously high and could lead to serious impacts and high costs on society. These other analyses come from the International Energy Agency, the United Nations Environment Programme, the World Bank, the European Environment Agency, and PricewaterhouseCoopers.